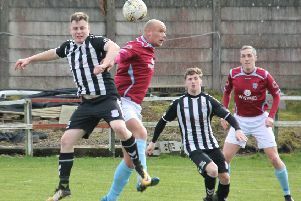 Kilsyth Rangers drew a blank with a disappointing goalless draw against Irvine Victoria at Duncansfield on Saturday, reports John Ferguson. Rangers fans had been expecting revenge for defeat at Irvine earlier in the season, but it was not to be. Although Rangers had most of the game they just could not find the finishing touch and had to be content with a share of the spoils. With hopes of a promotion spot long gone, and no danger of slipping into the relegation battle it is now just a case of finishing in a comfortable top half place and building for next season. A minute’s silence was observed prior to kick off in memory of Rangers keeper Michael Duke, who sadly passed away recently. 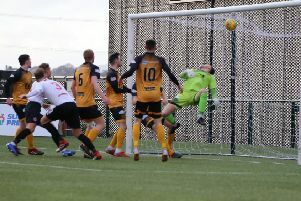 Rangers were facing the stiff breeze for the first half and had most of the early pressure, Smith had a good chance when he was through with only Vics keeper McDonald to beat but shot wide. The visitors were seldom seen in attack, although Craig looked like a threat when they did get up into the home penalty box. Another good chance for Smith when Rangers made a quick break but again he could not get his shot on target. No scoring at the interval just about summed up the first half. With the wind at their backs after the break Rangers were even more dominant in the early part of the second half but still they were not causing McDonald too many problems. When Victoria did push up they did show some clever play but their finishing was really no better. In the final quarter Rangers did step up the pressure and it was backs to the wall for the visitors for a spell but McDonald was performing heroics and made a great point blank save from a Kouider-Aissa header. This Saturday Kilsyth are away to bottom side Larkhall.